The Genting Casino Coventry Blaze moved into an Elite League playoff spot by beating fellow chasers Dundee Stars 2-4 on Wednesday night in Scotland. 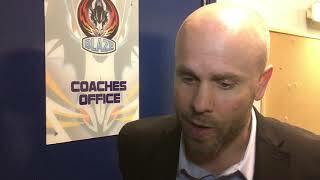 Thanks to support from the Blaze Booster Club, Coventry traveled the near 400 miles a day earlier and the preparation paid off as two goals in each of the second and third period gave Danny Stewart’s men a crucial victory. It took until 32.01 for the first goal to come as Blaze’s top point-scorer against the Stars Tim Crowder registered his 8th point in the 6 games played this season. At 35.40 the game was tied as Matt Bissonnette struck past Matt Hackett, but British forward Ross Venus, assisted beautifully by Norwegian Nicolai Bryhnisveen, his second helper of the night, put Coventry back ahead on 37.07. 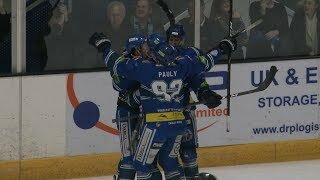 Shawn Pauly then doubled his assist tally, with Crowder getting another point on Ben Lake’s 32nd of the Elite League season to make it 1-3 (49.13). It was the Canadian's 5th in 6 games against the Stars this season. With Dundee’s hopes of a playoff spot fading, Brian Hart gave the home side hope by getting them within one at 55.46. Their hopes were dashed though on 59.39 as Blaze captain Kevin Morris fired into an empty net for a final score of 2-4.